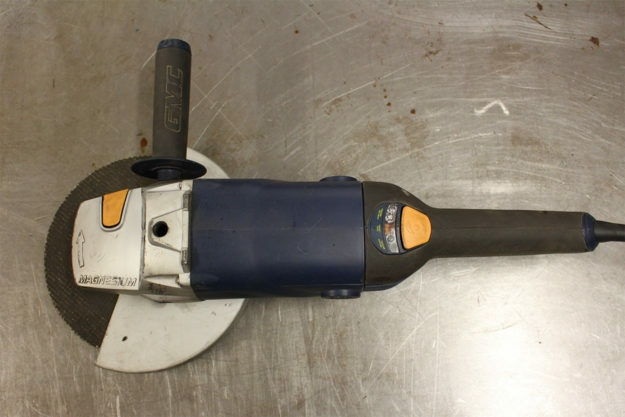 Our resident expert mechanic Matt McLeod reveals what he looks for when buying an angle grinder. Where would we be without the grinder? It lops off subframes, removes tabs and brackets in seconds, and provides pretty showers of sparks for what seems like every short film about a bike builder. Joking aside, power tools like grinders are great for speeding up your tasks. Can you cut steel with a hacksaw? Can you remove metal with a file? Sure, but it’s a lot quicker if you use an angle grinder. Angle grinders are generally classified by the nominal diameter of the accessories they use. 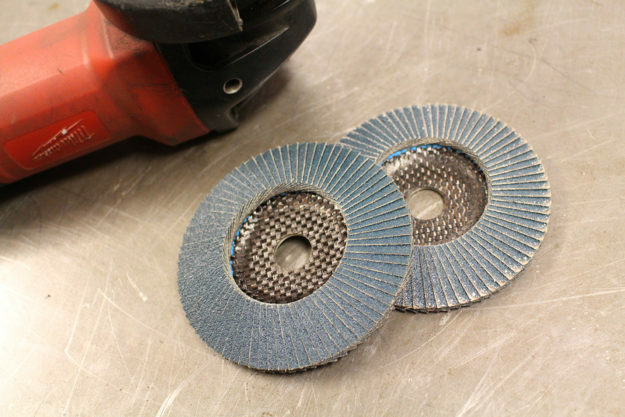 The typical cutting and grinding accessories are described as ‘abrasive,’ with particles bonded onto a wheel or disk. The materials used, and the construction of the wheel or disk, will depend on the application. 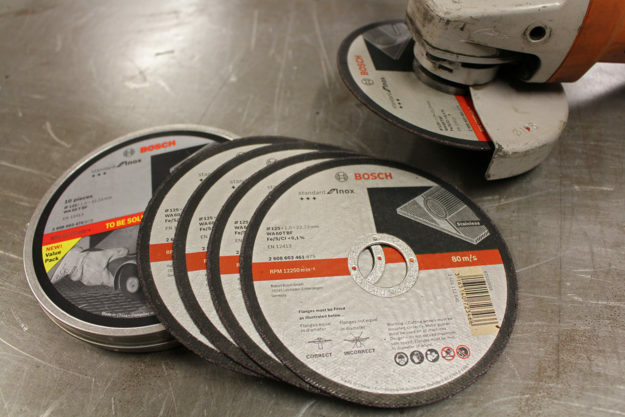 Discs used for cutting steel will be different to discs used for grinding stone, for example. The abrasive particles ‘scrape’ away material as they spin. Eventually they dull and break away from the bond, exposing new, sharp particles. This means the diameter of the wheel or disk decreases in use, until it is too small to be useful. The Four-Inch Grinder These three grinders are all 4-inch diameter tools, and are the cheapest ones you’ll generally find on the market for mass consumption. This is the first size I bought and it’s well suited to motorcycle tasks. When you’re using grinders on a regular basis it can be tedious changing accessories all the time. When these red Milwaukee grinders were on sale, I bought two. I can set up a cutting disk in one grinder and a grinding wheel or a sanding disk in another one. This speeds up my workflow. The Nine-Inch Grinder When I was remodeling our house, I needed to cut up some concrete, so I purchased the cheapest 9-inch grinder I could find, since I didn’t want to hire a demolition saw. This was great for big heavy jobs like concrete and roughly cutting up large steel sections. 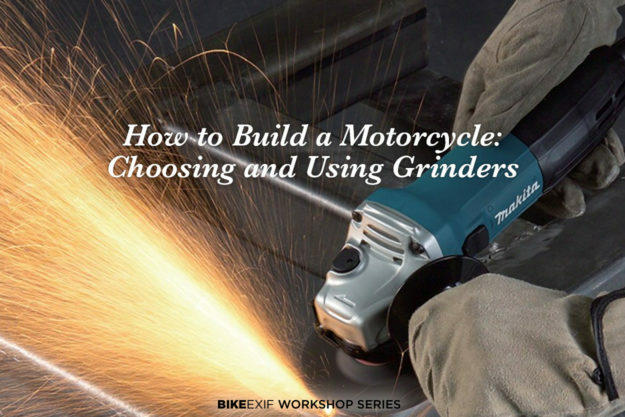 There is no ‘finesse’ with a 9-inch grinder, so it’s not suitable for motorcycle work. Don’t waste your money unless you have other needs for it. Bigger is not better in this case. The Five-Inch Grinder Some time later, I bought this 5-inch angle grinder. This size has turned out to be very useful for one reason: it will cut through 1-inch/25mm tubing from one side in a single cut. This is a common size used on older motorcycles, along with 3/4″ and 7/8″, or 19mm and 22mm for the metric world. If you’re cutting this tubing using a 4-inch grinder, you might only get three-quarters of the way through and then you have to turn around and cut from the other side. This makes a clean, straight cut more difficult. The accessories are a little bit more expensive, obviously, but they do last a longer than the 4-inch ones. I almost always leave a cutting disc in my 5-inch grinder and leave the 4-inch grinders for other duties. Purchase a cheap 4-inch grinder first. If you choose to purchase a second grinder, consider a 5-inch grinder if cutting tube is a common task. 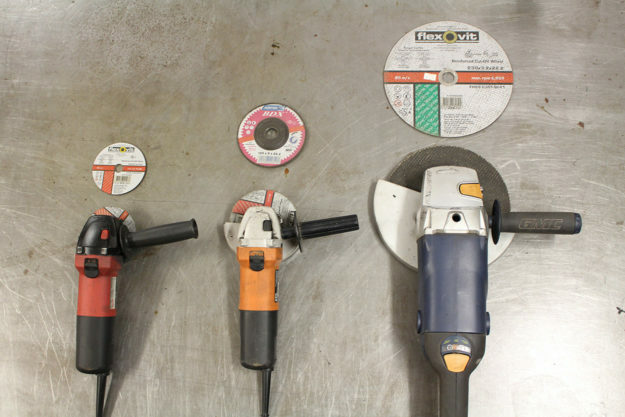 Grinder Accessories: Cutting discs Let’s talk a bit about the accessories that I’m using. 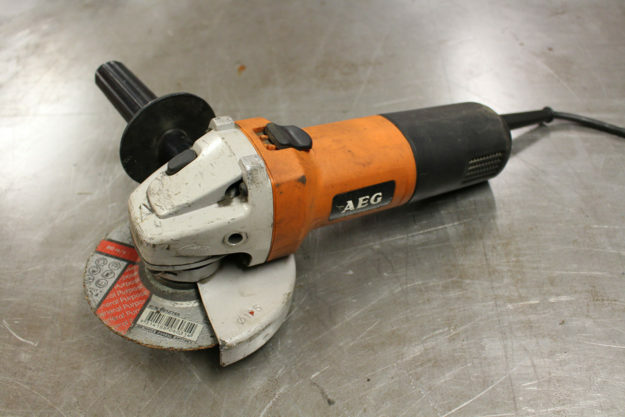 This particular grinder’s set up with the cutting wheel, or a cutting blade. The one-millimeters are my favorite: They allow you to cut through tube cleanly, quickly and with a thin ‘kerf’ (which is the thickness of the cut). Bosch makes these particular ones, and I just buy another box of ten when they’re on sale at my local hardware store. You don’t have to use this brand, but I can certainly endorse the quality. Sanding discs (flap wheels) The other accessory that I find very useful is a ‘flap disk’ or a sanding disk. 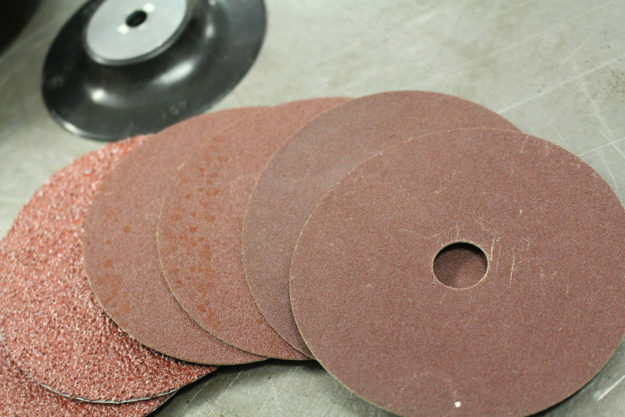 A flap disk is an array of sanding pads bonded to a backing plate, available in a range of abrasive grits. As they are used, the edge of the pad wears away to expose more abrasive. While they are relatively expensive, I think the better quality discs last quite a while. Again, this particular one’s Bosch, but only because it’s the brand my local store stocks. They aren’t cheap—in Australia they cost around about $7 to $8 each, but they do last quite a while. And they are very useful when working on a motorcycle. I prefer to purchase 100 grit or 120 grit. The really coarse grits (40, 60 or even 80 grit) are very aggressive and remove a lot of metal very quickly. One of my 4-inch grinders is always set up with a flap disc. Grinding discs I don’t generally use grinding disks on motorcycle jobs. 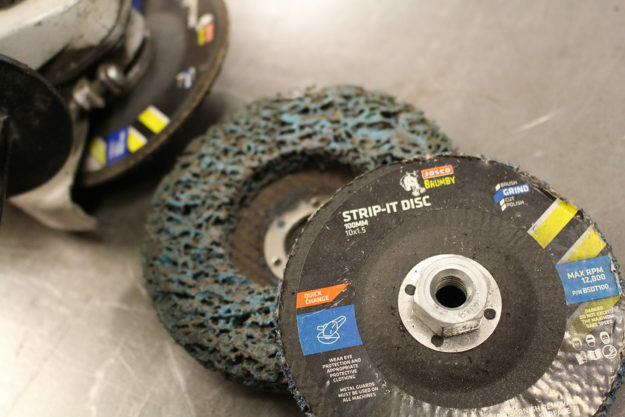 Similar to the coarse grit flap wheels, I think a grinding disc is a very aggressive method of removing metal. 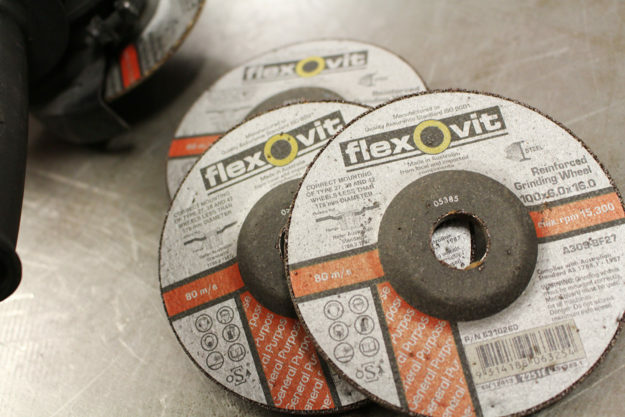 I tend to select a finer-grit flap disk before I would use a grinding disk. They are very cheap, but use them carefully on your motorcycle. Wire brush On my old Makita grinder, I’ve permanently installed a wire wheel. This is one of my go-to tools for stripping paint or cleaning rust off surfaces. 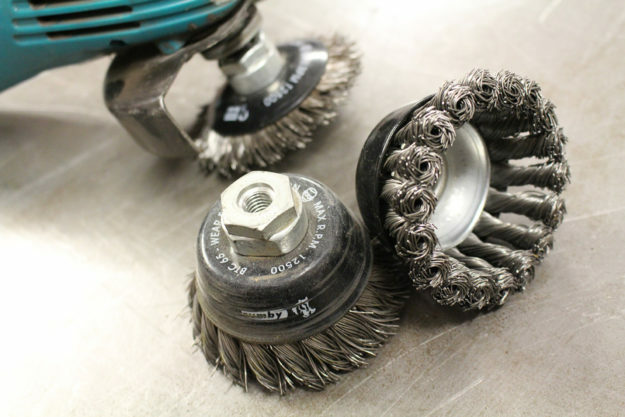 As the wire bristles spin, they smash paint and rust off a steel surface without significant damage. Steel bristles are harder than aluminum, so they will damage an aluminum surface. The bristles will remove paint and rust from irregular surfaces: I have stripped a complete motorcycle frame back to bare metal with a wire wheel on a grinder. This grinder is used exclusively with a wire wheel. Since the wire wheel is much heavier than a cutting disc, it puts a more load on the electric motor and will probably quicken the grinder’s eventual demise! These are great for motorcycle work, especially for larger, flatter surfaces, such as fenders and gas tanks. With an angle grinder, a paint stripping disc and a wire wheel, you can remove paint from a whole motorcycle. Would it be quicker to send it for sand blasting or dipping? Sure, but you can do it at home at low-cost with these tools. You can see me demonstrate both wire wheels and paint stripping discs on a gas tank in this video. I have stripped a number of tanks and fenders with these wheels, and in my non-scientific tests, I find the 5-inch version lasts a lot longer than the 4-inch version. This would suggest its more economical to buy these in 5-inch if you have a 5-inch grinder. 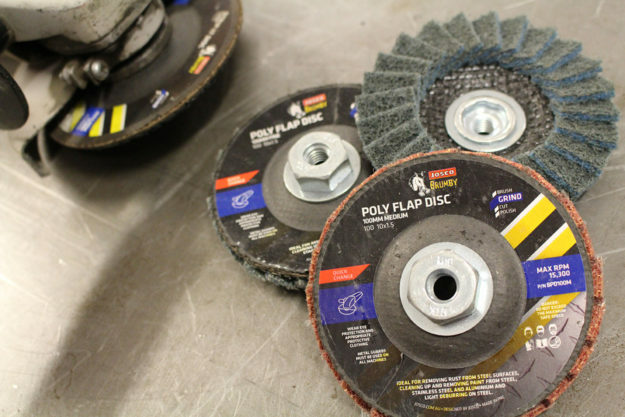 Synthetic non-woven flap discs Similar in construction to a flap wheel, synthetic non-woven flap discs contain a polymer abrasive rather than an abrasive particle pad. Different colors indicate different grades, and these are great for final sanding and surface smoothing. They are much less aggressive than a sanding flap disc, so they’re relatively safe to use on aluminum surfaces. Alternate sanding discs I’ve been experimenting with sanding disks which need backing plate. I was wondering whether it would be cheaper to use something like this than to pay for a sanding flap disk. But as far as I can tell, a flap disc still wins. You seem to get far more material removed with a flap disc. I think this is due to the flap disc revealing new abrasive as it wears. Once these sanding discs are worn, they go in the trash. It was just an experiment to see what would happen. Stick with flap wheels if you can. Want more suggestions on which grinder to purchase? Click here to download the Angle Grinder shopping list. Grinder use and safety There’s obviously a big potential for accidents with grinders. But if you take a few basic precautions, you can minimize that potential. 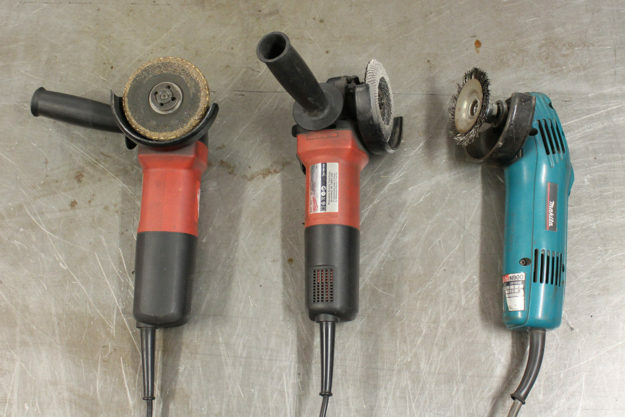 Match your accessories to the spindle on the angle grinder. The packaging or instructions will specify the bore (the hole in the center of the disc) that fits your grinder. Wire wheels are sometimes supplied with a threaded fitting, which screws directly onto the spindle. All my 4-inch grinders have a metric threaded spindle; their size is an M10 x 1.5 thread. Make sure you center the disc on the spindle, and clamp the disc snugly between the inner and outer flanges. The tools provided with the grinder are needed to secure the outer flange nut. Grinders drive the spindle very quickly, and this speed combined with the abrasive material does the work. But don’t press the disk into the work heavily: If you hear the motor slowing down, you’re overloading it, and risk the tool kicking back if the disk gets jammed. Let the disk and the grinder do the work. I see lots of YouTube videos showing angle grinders with the disk guard removed. I’m not really sure why people remove these guards. Your fingers are wrapped around the body of the angle grinder less than two inches away from a disc spinning at 10,000 rpm. With no guard, you are risking a visit to the Emergency Department if the grinder kicks back. While you are merrily cutting or grinding, you’re sending showers of sparks (which are burning carbon) and small shards of metal flying through the air. It’s a great idea to protect your eyes from this airborne metal and sparks. If you’re spending a couple of hours paint stripping a motorcycle frame or tank, a disposable dust mask will reduce how much ends up in your nasal passages and lungs. And when I’m using an angle grinder, I’ll generally wear hearing protection. All that airborne metal and carbon will coat any surrounding surfaces, so protect items such as disassembled engines, transmissions and carburetors from ingesting this nasty stuff. Move those parts, or cover them while you’re working. Wire wheels will start ejecting wires after heavy use. They can be found embedded in your clothing in unusual locations, at inopportune times. Cover your arms and legs with heavy workwear to provide maximum protection. Finally, it’s wise to look around before you start cutting or grinding, and check for fire hazards. It’s easy to accidentally divert sparks onto your clothes and burn yourself. Don’t ask me how I know this! And above all, have some fun on your project!